I was reminiscing about when my daughter was a teenager. Like all teenagers, she went through numerous phases. It is all part of their exploration of life. They will obsess over something for a month or two then it is forgotten for something new and different. It is the same with fashion or hair style or music or even vocabulary. My daughter went through one particularly obnoxious phase once when she was constantly saying, "Oh, bite me." I am not sure if she picked that up from Bart Simpson or from her friends at school but that seemed to be her pat response to just about everything. She must have said it a few hundred times a day and this phase of hers seemed to last forever. I let it be because I knew it would pass but she was holding onto it for a long time. Then one hot summer day I drove my daughter out to the baseball fields by the river. She had just joined a softball team and wanted to practice her hitting so I spent an hour pitching to her so she could practice hitting. Afterwards we were walking back to the car and she was scratching herself like crazy. Being close to the river, the ball fields were swarming with mosquitoes. "I must have a hundred mosquito bites," she yelled as she threw her gear into the back seat of the car. Looking at me she asked, "Don't you have a bunch of mosquito bites, too?" "No, I don't have any." "That's not fair! Why don't you have any?" I explained to her, "I don't have any mosquito bites because I don't go around saying, 'Bite me,' all the time. When you say, "Bite me," repeatedly, that goes out into the universe and the universe has to oblige you. The mosquitoes were merely doing their part in manifesting your stated desire to be bitten." I got into the car. My daughter got in and remained silent for a few minutes as she scratched herself. She finally spoke up on the drive home, "Seriously, why don't mosquitoes bite you?" "I just told you why. But if you don't want to believe me that's fine. Just think about it. If you want another reason why they bite you and not me it's because you taste so darn good and I don't." "Okay, you want another reason? I eat bananas on a regular basis and bananas have a natural mosquito repellent in them. I also eat garlic which mosquitoes hate. I also try to maintain a balanced blood PH and I mostly avoid junk food. 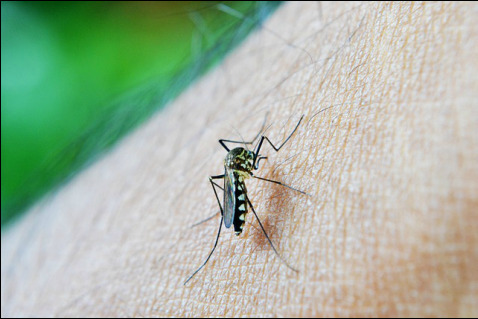 Mosquitoes love acidic blood and they love to bite people who eat a lot of junk food." My daughter rolled her eyes, "Oh Dad, get real! You're just saying that because you know I hate bananas and garlic." As a dutiful parent I have tried to be real ever since. My daughter must have given what I said some thought--although I'm not sure which part. I never again heard her say, "Bite me," since that hot afternoon at the ball fields. Her phase ended right there and then.